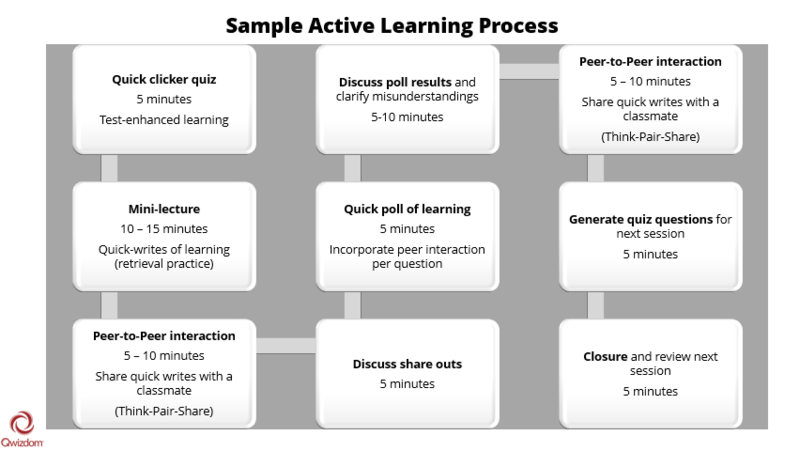 Educators can agree that an active learning approach can lead to greater improvements and gains than traditional “lecture and note-taking” settings. Encouraging peer-to-peer interaction can help students construct knowledge and understanding, with an awareness of their own thinking as a by-product. 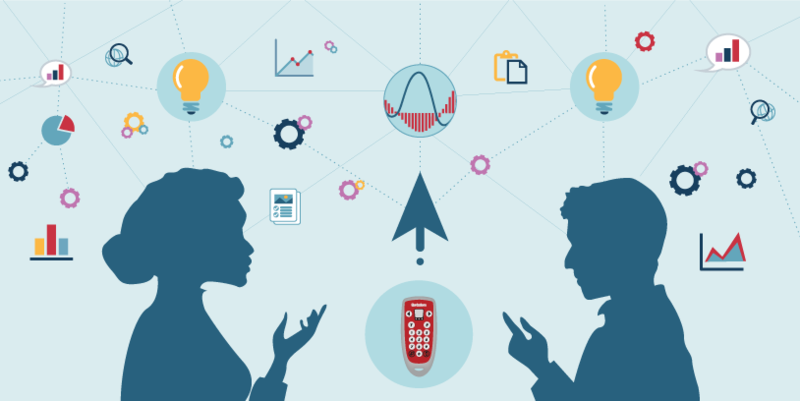 For higher education settings, Qwizdom Actionpoint, a PowerPoint plugin, can transform the traditional slide presentation to an interactive learning environment. Below is a sample of active learning incorporated in an introductory psychology lesson (60 minutes). Which identifies a type of memory? Which is an example of short-term memory? Which is an example of long-term memory? 10 – 15 minutes – Mini-lecture on encoding, storage, and retrieval. Two-minute quick write after the introduction of each process (i.e. What is encoding?). This is an example of retrieval practice, an exercise that improves long term memory and the capability to learn new material. This practice can also help the student connect information to new learning in different areas. 5 – 10 minutes – Peer-to-peer discussion of quick-writes. This think-pair-share method requires students verbalize their learning. 5 minutes – Student share-outs of discussion. This also gives an opportunity to clear up misunderstandings and/or provide further explanation on the learning. 5 minutes – Quick poll of class learning. This is enhanced peer instruction using a response system (devices or apps). Pose a question that requires students to think about their answers before voting using a response device (i.e. Qwizdom Q6 remote or QVR polling app). Then have students turn to a classmate to discuss their answer choices. If during the discussion students want to change their answers, encourage them to do so. Share the data before and after the partner discussions which creates a foundation for further discussion on the learning. Actionpoint offers a variety of question types besides multiple choice such as true/false, multiple select, sequence, and vote. The system also provides instant feedback and student data that can be shared with a large group. Use a graphic of Bloom’s Taxonomy, including key verbs for each category (create, evaluate, analyze, apply, understand, remember), as a reference to generate clicker questions. Have partner teams or small groups write a question or two from today’s learning to introduce the next session. Collect student-created questions for a dynamic course study guide that can be posted to a class web page. works with your curriculum content. provides instant feedback to all involved in the learning. generates detailed performance reports for later analysis. To learn more about Qwizdom response solutions, go to www.qwizdom.com.